style. These cute Patriotic Garden Flags by Toland are the answer. Choose your favorite -- cats or dog. This adorable pup is showing off his patriotism with his American flag bandana. The red, white, and blue theme is carried on into the background with red geraniums, white butterflies and daisies, and a blue wall. 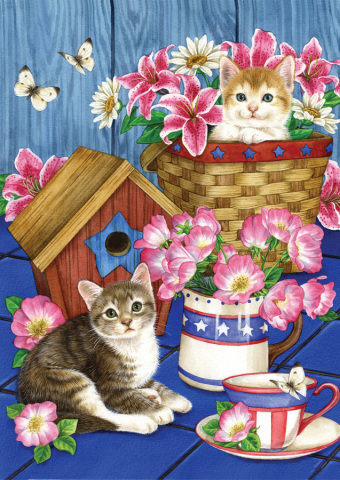 These mischievous meowers are surrounded by items with American flag themes, just waiting for a chance to catch any bird who tries to get into the birdhouse. Flags are made of durable polyester and are heat, mildew and fade resistant for years of use. Machine washable. Available in two sizes. 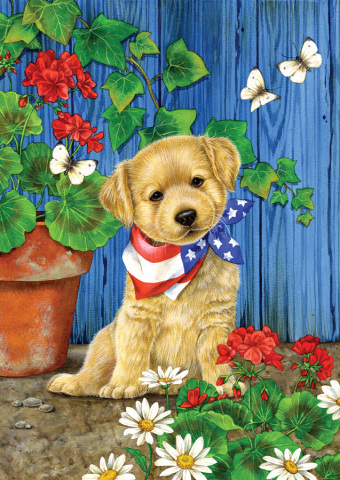 For more information or to order the Patriotic Puppy Flag, click here. For more information or to order the Patriotic Kitties Flag, click here.